Canberra is well-known for its tourist attractions, including the National Arboretum and Tidbinbilla Nature Reserve. However, in 1975 a proposal was suggested for a tourist attraction of a very different kind for Canberra. The promise was not only to bring significant numbers of tourists to the city but also provide locals with a further option to enjoy one of the most popular natural areas of Canberra. With this in mind, in July 1975, Black Mountain Cable Car Pty. Ltd. submitted a proposal to the Department of the Capital Territory, to construct a cable car or aerial gondola system on Black Mountain that would bring people to the Territory and provide a bird’s eye view of the city. Black Mountain Cable Car Pty. Ltd. was established by a small group of Canberra businessmen. They envisaged a new attraction with 35 gondolas, speeding 800 passengers an hour on a 5 minute each-way journey up Canberra’s most prominent mountain at $2 a ticket. They were prepared to invest $2 million dollars to make it a reality. This intriguing idea was the topic of discussion for many years and for this reason records outlining the proposal to install a cable car system on Black Mountain are ArchiveACT’s May Find of the Month. A feasibility study of the Black Mountain Aerial Gondola System conducted in April 1982 reported 2,711,000 visitors to the ACT from February 1981 to January 1982. By this stage there was a new attraction in town. 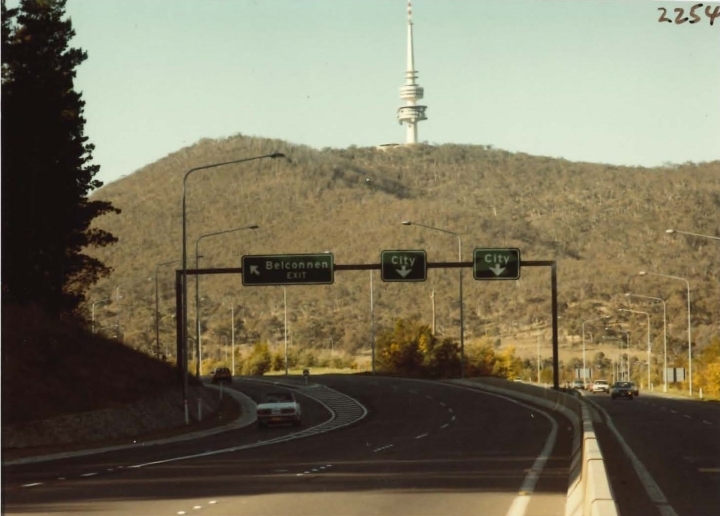 On 15th May 1980 a new telecommunications tower was opened on Black Mountain, known as Black Mountain Tower (now known as Telstra Tower). The feasibility study reported an average of 18.6% of visitors to the ACT included Black Mountain Tower in their itinerary. Black Mountain Cable Car Pty. Ltd. suggested 30% of visitors to Black Mountain Tower would use their aerial gondola, and, based on the new proposed fares of $2.80 per adult and 80c per child, annual gross revenue in the year after construction would be close to half a million dollars. The aerial gondola system was about more than tourism. Proponents of the project suggested the cable car would assist with serious access issues relating to Black Mountain. The Interdepartmental Sub-Committee charged with studying traffic and pedestrian access to Black Mountain found that the existing parking facilities were close to saturation during peak periods, stating “Black Mountain is the most problematic of all features. Access by private car and coach is already less than demand at any point in time”. Although not officially opened until 1980, Black Mountain Tower was already a cause for concern for the government, which had been working to solve potential issues of public access and insufficient space for parking. The ACT Advisory Board on Tourism first raised these issues in a letter to the Minister in 1978, suggesting that a feasibility study be undertaken on the cable car proposal. As reported in The Canberra Times, the response by the Department of the Capital Territory and National Capital Development Commission was largely to wait and see. They were in no hurry to investigate a proposed cable car system for Black Mountain until after the opening of Black Mountain Tower and until they had adequate time to assess the impact the tower would have on access and parking in the area. James Cullens, Director of Black Mountain Cable Car Pty. Ltd., reported that there was considerable public support for the project and in May 1978 several members of the ACT Legislative Assembly, which advised the Minister for Territories on ACT matters, expressed their support. However, there was also opposition from a number of sectors including various community groups such as the Society for Growing Australian Plants and the National Botanic Gardens, who were concerned about the impact on vegetation in both their gardens and on Black Mountain. At a public meeting held at Gold Creek Homestead in February 1978, City Manager, Tony Blunn, discounted the idea that the cable car would provide improved access to Black Mountain, suggesting that a widened road or scenic railway may be better propositions . Black Mountain Cable Car Pty. Ltd. were not giving up easily though, and undertook a costing and engineering study of the project in which they reported that the cable car system could be built easily with minimal environmental impact within a timeframe of only six months. 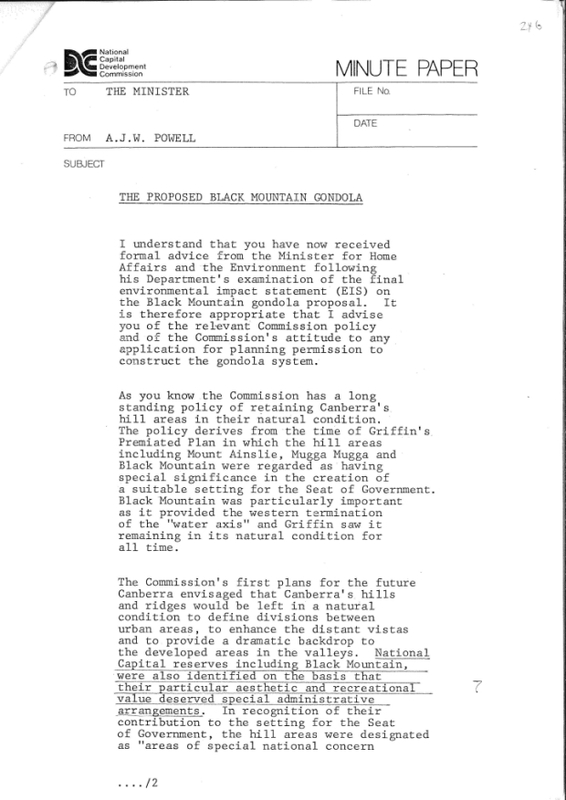 There was also support within the Draft Environmental Impact Statement, prepared by Environmental Research Associates in 1981, in which they concluded that the project would have a positive impact on tourism in Canberra and the physical and biological impact of an aerial gondola system would be very low. Time would show that Black Mountain Tower quickly became a major tourist attraction. The opening of the tower viewing platform and restaurant had made Black Mountain the most popular tourist attraction in Canberra even overtaking the Australian War Memorial. In December 1980 the tower was visited by 33,281 adults and 9,308 children and this boded well for the aerial gondola system. By most accounts, in early 1981 the project was enjoying relatively wide support. So why are we not currently enjoying gondola rides up and down Black Mountain? Following the publication of the Draft Environmental Impact Statement, concerns were raised that a number of factors may not have been properly explored. There was a view that detailed information about the construction and erection of the masts for the aerial gondola system had not been supplied. There were also criticisms that the report was too generalised, lacking information on a number of key areas such as the clearing of vegetation, removal of spoil, restoration of disturbed areas, car parking, landscaping and the extent of tree lopping. The Department of Home Affairs and Environment expressed dissatisfaction with the Draft Environmental Impact Statement, particularly in relation to the increased traffic the initiative would bring to the area. 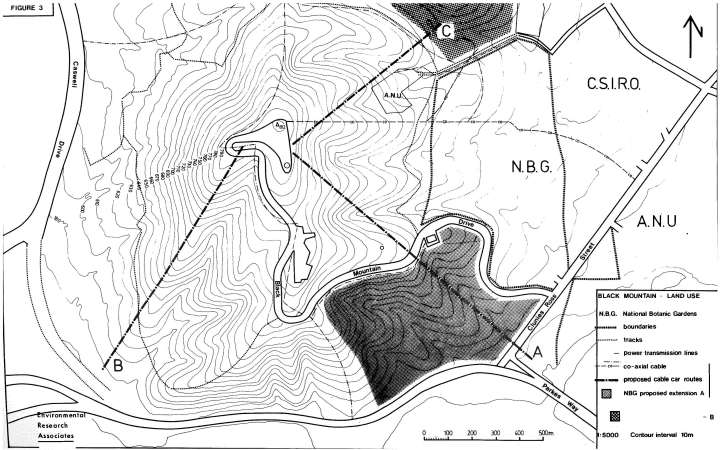 Their assessment of the report highlighted some key issues including the impact on the National Botanic Gardens, congestion on Black Mountain, the dominating visual impact of an aerial gondola, conflict with the Australian National University over land use and the apparently optimistic view regarding patronage. …the policies and proposals of the Department of the Capital Territory and the National Capital Development Commission relating to the general conservation objectives of the Black Mountain Reserve and the Botanic Gardens. Particular conflicts were identified in relation to the Burley Griffin Plan and the 1964 Concept for Canberra regarding Areas of Special National Concern. Commissioner for the National Capital Development Commission, A.J.W. 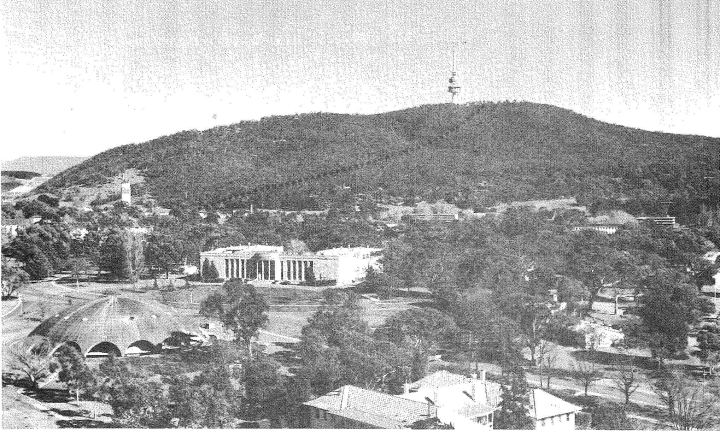 Powell, reported that permission to erect the aerial gondola would require a change in the policy of the National Capital Development Commission in relation to Black Mountain as set out in the National Capital Development Act 1957 (Cth), which would in turn require a revocation by the Governor-General. He stated that the Commission’s position was “that there is no intrinsic relationship between Black Mountain as a hill feature and nature reserve, and an aerial gondola system, which provides a compelling argument to permit its erection”. And so it was that in July 1983, eight years after the project was first proposed, it was officially given the final death knell when the Minister for Territories and Local Government, Tom Uren, advised that he would not approve the proposal, largely on environment grounds. Do you have any memories of the proposed cable car? ArchivesACT. Black Mountain Tower from Glenloch Interchange. The economic and social impact of visitors on the A.C.T. : a report / prepared by Pannell, Kerr, Forster and Company for National Capital Development Commission, Department of the Capital Territory, Department of Industry and Commerce, 1977. 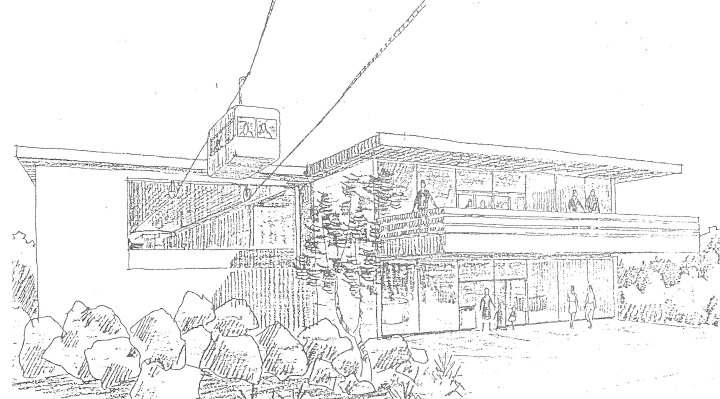 A proposed aerial gondola system for Black Mountain, Canberra: Draft Environmental Impact Statement / prepared by Environmental Research Associates, February 1981.